I acquired this item from a second hand store for twenty bucks even tho it was missing the power cord and the power button plastic face cover (purely cosmetic). I had an power cable at home that I wasn't using and used it for this when I brought it home. It worked 100%! Bingo- this was exactly what I wanted (and more) for a 2.1 music only rig. I got my turntable, cassette tape deck, 8-track tape deck ( that's right an 8-track), and CD player all hooked up to the Integra 5.3 receiver that powers a pair of vintage 6 ohm GNP Valkyrie floorstanding loudspeakers on "A" and a pair of vintage 8 ohm JBL LX22 bookshelf speakers. Subwoofer out is LFE'd to a powered Boston CS10 MkI bottom firing subwoofer. Overall it's a good system which does what I wanted and sounds wonderful and balanced in highs, mids, lows, and sub lows. Set up is simple and the Integra is very user friendly, well thought and designed ergonomics for ease of use. Sound is clean and crisp, detailed separation of instruments, great imaging and dynamics. The front illumination display features a dimmer. Easy to read. The rear features RCA inputs for DVD and Video as well, fm am radio antennas, BUS ready, zone 2 with trigger, switch for 4 or 8 ohm load speakers, subwoofer preout, video monitor out, two sets of binding posts, and detachable power cable. It's 80 wpc, 10Hz-100kHz, .08% distortion, 60 damping factor (very nice), 200 dB line level input/output sensitivity, 100dB signal to noise (most other brands are around 87-93dB). In conclusion, my Integra has performed flawlessly giving me wonderful audio pleasure and pride in my equipment. I have nothing negative to say about this unit. When it works it works well, but I'm on my second repair in 7 years. It goes into protect mode for no apparent reason and is costly to repair. I have an old Denon that I use for back up, while the Integra is off being repaired, that has no "protect mode" issues. I would not buy an Integra product again. 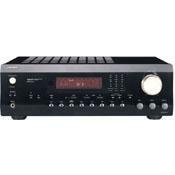 I bought this receiver used almost 5 years ago in spite of the 1 unfavorable review herein. The receiver is still performing flawlessly. I bought it because it put out 100 watts per channel and had inputs for my CD player, turntable, 2 tape decks, and video. FYI- Integra is the high-end division of Onkyo, a high quality mid-market manufacturer. I previously owned an Onkyo TX-8511 whih was also trouble free. Works quite well BUT I am now on my 2nd or 3rd repair in 6 years, which I don't find acceptable. The "Protect" light goes on, and the unit switches off. Last time this cost me $160 to repair. Not sure it is worth it.